Although the etiology of depressive mood disorders is still unclear, it is strongly influenced by genetic (McGuffin, 1988; Kendler et al., 1992) and environmental factors which include the maternal milieu during gestation (Weinstock, 1997). Recurring inescapable or uncontrollable stress can lead to chronic anxiety, feelings of hopelessness and defeat, and depression. This is associated with overactivity of corticotropin releasing hormone (CRH) and dysregulation of the hypothalamic-pituitary adrenal (HPA) axis (Chrousos and Gold, 1992; Behan et al., 1997). Mood disorders have also been reported in the offspring of women that were exposed during pregnancy to physical and psychological stress, such as marital and family discord (Stott, 1973), the threat of impending war (Meier, 1985), or death of the spouse in World War II (Huttunen and Niskanen, 1978). Those children exhibited excessive crying and clinging to the mother and unsociable or inconsiderate behavior towards other children. In prenatally-stressed (PS) teenagers, there was a higher incidence of alcohol intake, antisocial and criminal behavior, depressive and neurotic episodes (Huttunen and Niskanen, 1978). Since of necessity, such analyses in humans are retrospective and cannot be controlled for genetic and postnatal environmental factors, most of our information about the behavioral and neurochemical sequelae of gestational stress is derived from studies in experimental animals. 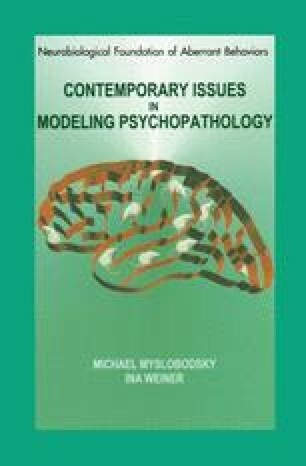 This chapter describes the experimental evidence obtained in such studies in support of the hypothesis that prenatal stress can induce permanent changes in the behavior, regulation of the HPA axis and corticotropin releasing hormone (CRH) that are consistent with those seen in depressive mood disorders.